High levels of public debt are correlated with lower economic growth across countries, but questions remain about whether this relationship is causal. Using Chinese data, this column explores whether increasing public debt crowds out private investment. City-level investment ratios are found to be negatively correlated with local government debt for private manufacturing firms, but not for state-owned or foreign-owned manufacturers. This suggests that as well as the short-term benefits of fiscal stimulus, there might also be negative longer-term effects, such as the crowding out of more efficient firms. The Global Crisis has led to a rapid increase of public debt in developing and advanced economies. Between 2008 and 2015, the average public debt of advanced economies went from 79 to 105% of GDP, and that of emerging market and middle income countries from 35 to 43% of GDP (IMF 2015). What are the consequences of this rapid increase in debt for our future standards of living? In basic economic models, debt-financed public expenditure can reduce future economic growth by crowding out private investment. Indeed, high levels of public debt are correlated with lower economic growth across countries (Reinhart and Rogoff 2010, Cecchetti et al 2011). However, assessing whether this relationship is causal has proven more difficult (Panizza and Presbitero 2013). China is an ideal laboratory to study how public debt affects the real economy. China responded to the Global Crisis with a massive fiscal stimulus. In November 2008, the Chinese government announced a 4 trillion renminbi (RMB) (approximately $US590 billion) stimulus package. Implementation was immediate and mostly channelled via local governments. 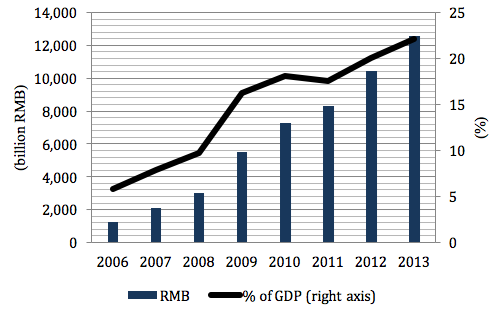 In 2009 city-level debt increased by RMB2.5 trillion (Figure 1), while central government debt increased by RMB700 billion (going from 5.3 to 6 trillion). In a recent paper, we collect data for local government debt covering 261 prefectural level cities over the period 2006-2013 and use these data to test whether local government debt crowds out private investment (Huang et al. 2016).1 Chinese cities are ideally suited to test the ‘local crowding-out hypothesis’ for three reasons. Most Chinese cities are very large, in many cases comparable to medium-sized countries. In our sample, the median city’s population is 3.8 million, and out of a total of 196 cities, 100 have at least 5 million inhabitants and 25 cities have more than 8 million inhabitants. In China, local government debt varies greatly over time and across cities, as shown in Figure 2. In our sample, city-level debt-to-GDP ratios range between 0 and 148%, with an average of 8% and a standard deviation of 15. We merge city-level information on local government debt with a nationally representative survey that covers more than 350,000 manufacturing firms and use three different strategies to test for local crowding-out. First, we show that the city-level investment ratio of private manufacturing firms is negatively correlated with local government debt, while that of state-owned and foreign-owned manufacturing firms is not. We control for the endogeneity of public debt issuance via an instrumental variable strategy. Second, we use industry-level data to test whether local government debt is particularly damaging for industries that need more external funding. This approach allows us to investigate whether government debt affects investment by tightening credit constraints. It also reduces endogeneity problems by allowing us to control for city-year and industry-year effects. Again, we find that local government debt is associated with lower investment of domestically owned private manufacturing firms that need external financial resources, but not with investment of state-owned and foreign-owned manufacturing firms. Finally, we use firm-level data to test if local government debt affects the sensitivity of investment to internally-generated funds for firms that are more likely to be credit constrained. Our focus on firm-level data allows us to include a rich set of fixed effects and rule out concerns of reverse causality from investment to local government debt. Consistently with our previous estimates, we find that local government debt affects cash-flow investment sensitivity for credit-constrained firms but not for unconstrained firms. China responded to the financial crisis with a massive fiscal stimulus. At first glance, the stimulus was a resounding success. China was able to escape the great recession and became one of the main drivers of world economic growth in the post-crisis period (Wen and Wu 2014). But what is the impact of the stimulus on China’s future economic growth? Here, the answer is not clear. On the one hand, China’s aggressive policy may have prevented an economic contraction which, in the presence of hysteresis (Fatás and Summers 2016), could have reduced China’s growth potential. On the other hand, our estimates suggest that this view is likely to be overly optimistic. The massive increase in local government debt in the post-crisis period had a negative effect on the investment of private manufacturing firms. As private manufacturing firms have much higher levels of productivity than state-owned manufacturing firms (Song et al 2011), this reallocation of investment from private to state-owned firms may have negative effects on China’s long-run growth potential. Moreover, by boosting the fraction of public debt in banks’ portfolios, this policy has strengthened the bank-sovereign nexus in China – a nexus that going forward may generate serious systemic stability risks, as illustrated by the sovereign debt crisis in the Eurozone (see Acharya et al. 2014 and Altavilla et al 2015, among others). Acharya, V, I Drechsler and P Schnabl (2014) “A pyrrhic victory? Bank bailouts and sovereign credit risk”, Journal of Finance, 69: 2689-2739. Altavilla, C, M Pagano and S Simonelli (2015) “Bank exposures and sovereign stress transmission”, CSEF Working Paper No 410. Ambrose, B, Y Deng and J Wu (2015) “Understanding the risk of China’s local government debts and its linkage with property markets”, mimeo, National University of Singapore. Ang, A, J Bai and H Zhou (2015) “The great wall of debt”, mimeo, Columbia University. Bai, C-E, C-T Hsieh and M Song (2016) “The long shadow of a fiscal expansion”, Brookings Papers on Economic Activity, Fall 2016. Cecchetti, S, M Mohanty and F Zampolli (2011) “The real effects of debt”, BIS Working Papers No 352. Fatás, A and L Summers (2016) “The permanent effects of fiscal consolidations”, NBER, Working Paper 22734. Gao, H, H Ru and D Y Tang (2016) “Subnational debt of China: The politics-finance nexus”, mimeo, University of Hong Kong. Huang, Y, M Pagano and U Panizza (2016) “Public debt and private firm funding: Evidence from Chinese cities”, CEPR Discussion Paper 11489. IMF (2015) Fiscal monitor April 2015, International Monetary Fund, Washington, DC. Panizza, U and A Presbitero (2013) “Public debt and economic growth, one more time”, VoxEU.org, 25 April. Reinhart, C M and K S Rogoff (2010) “Debt and growth revisited”, VoxEU.org, 11 August. 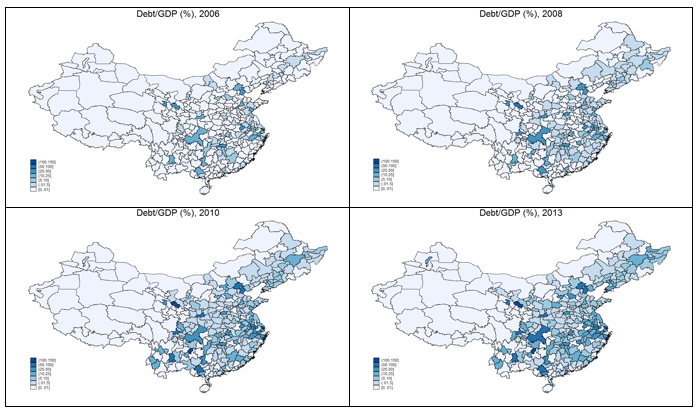 Zheng Song, Z, K Storesletten and F Zilibotti (2011) “Growing like China”, American Economic Review, 101: 196-233. More precisely, we focus on total debt issued by Local Government Financing Vehicles (LGFVs). While most of the literature (e.g. Ambrose et al. 2015, Ang et al. 2015, Gao et al. 2016) has focused on bond issuances, we compute the stock of total debt (outstanding bonds plus bank loans) by collecting micro-level data from LGFVs’ balance sheets. Bai et al. (2016) study how the Chinese fiscal expansion reallocated credit to politically connected firms.